Digital PS VR version reviewed using a standard PS4, and a PS Move controller. 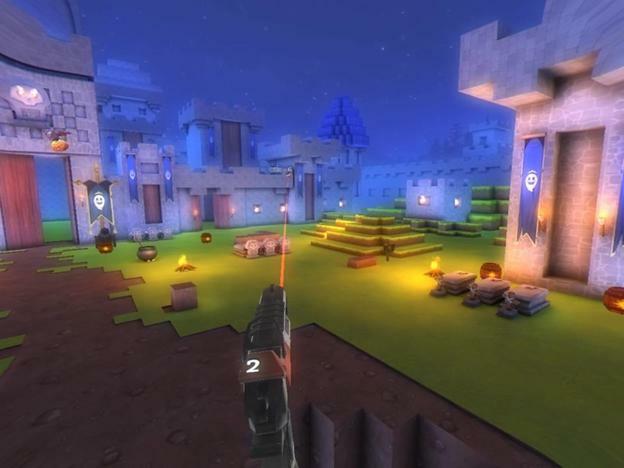 'Pixel Gear' is a relatively simple first-person shooter that feels like the VR successor to the light gun arcade games of yore. Using the PS VR headset to look around and a Move controller to aim and fire the gun, it’s up to the player to take out all manner of nasty pixelated baddies — such as ghosts, skeletons and undead knights. 'Pixel Gear' is about one thing and one thing only: shooting stuff, arcade-style. I have to admit I got a big kick out of my first few minutes with the game; there was something ultra-intuitive about being able to physically look around by turning my head and aim by moving my hand. I had way too much fun at first holding the gun sideways and putting it up in front of my face to admire the details (although the rather muddy textures made me put it back down quickly). As for the actual gameplay, this is your prototypical light gun shooter, albeit with the player’s perspective planted firmly in place. Enemies come in, mosey about, then aim to kill — giving the player plenty of time to knock them out before they can land a hit. After each round, a number of ghosts and angels fly up into the air; shooting the ghosts earns points and adds whatever item they’re holding to the inventory, while shooting the angels causes the score to plummet by a whopping 2000 points. This was a particular annoyance when the 2D ghost and angel figures overlapped, causing me to shoot an angel I didn’t know was there. Some of the ghosts carry coins, which can be used to purchase additional weapons and upgrades in between rounds. When it comes to weapons, I had my pick of a machine gun, sniper rifle and grenade launcher, each of which could be added to my inventory with enough cash. The former’s rapid-fire capability is the most useful, while the latter two seemed to be a waste of space from my perspective. Sure, the grenade launcher can hit multiple enemies within a wide range, but its low ammo and clip counts rendered it impractical for most levels. As for the sniper rifle, well… it's farcically useless. Unlike the other weapons, which have laser sights that make for easy aiming, the rifle makes use of a ludicrously blurry scope — ironically making it the most difficult weapon to be accurate with. I may have had fun with my first few moments in 'Pixel Gear,' but the cracks started to show sooner rather than later. Make no mistake, the gunplay is viscerally satisfying outside of the problems with the two aforementioned weapons, but the issue comes down to the lack of variety. With few enemy types and just three levels to battle them in, the realization that there isn't much content here sets in fast. And while the level-ending bosses are a welcome change of pace, unmatched in spectacle, I have to admit I found many of the "strategies" to defeating them odd. 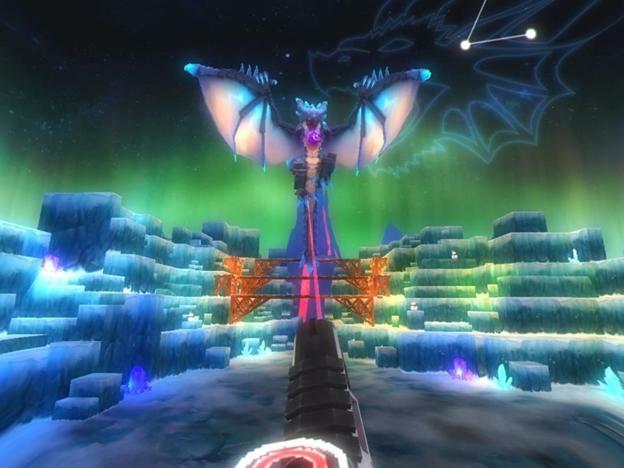 For example, the boss in the third level — an admittedly cool-looking dragon — must be shot during one specific frame of animation to take damage. 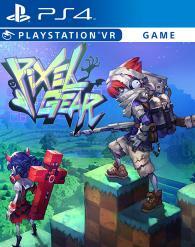 The title of 'Pixel Gear' is indicative of the visual aesthetic here: pixelation is the name of the game, with low-resolution textures and low-poly models that bring to mind the similar style of 'Minecraft.' 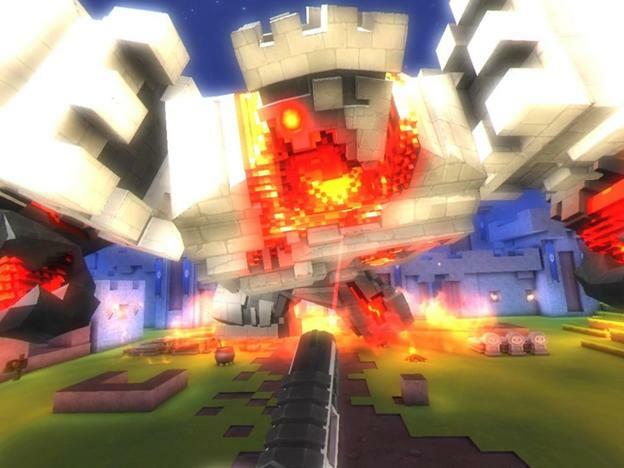 I found this pretty appealing for the most part, particularly when it came to the giant bosses at the end of each stage — these hulking monstrosities are fun to look at, with the appearance that they were built using hundreds of LEGO bricks. As previously mentioned, it can be difficult to make out certain details both close and afar; the blurry scope on the sniper rifle is nightmarishly bad, while distant enemies appear as little more than colored blobs. This made me realize that PS VR games would do well to keep the action fairly close to the player’s perspective, or focus more on the big picture than the finer details. Unfortunately, 'Pixel Gear' is pretty irritating in the audio department. The music consists of the same track looping ad nauseam across the three levels, and the sound effect volume seems wildly inconsistent. Some are barely audible in the mix, while others — like the high-pitched "TING!" that plays when the helmet of an undead knight is shot off — were so loud they made me wince. As with the lack of polish in some of the gameplay mechanics, this makes the proceedings feel a bit amateurish. Since 'Pixel Gear' is a score-driven shooter, replay value is an important aspect of its offerings. The three levels don’t really feel all that different from each other, unfortunately, so it's up to the different difficulty levels to add variety. I didn't feel all that inclined to return after clearing all the levels on Easy and Normal, but I can definitely see other players keeping the game on their system for a quick round every now and then. I also got the sense that a little extra polish would have went a long way here — two of the weapons are practically worthless, and the unintuitive boss battles feel amateurish despite being a welcome change of pace. After the initial fun wears off, this game is probably best for folks looking to waste some time while waiting for a download; it's a shame, since a few more levels and enemy types could have made chasing high scores an addictive prospect.